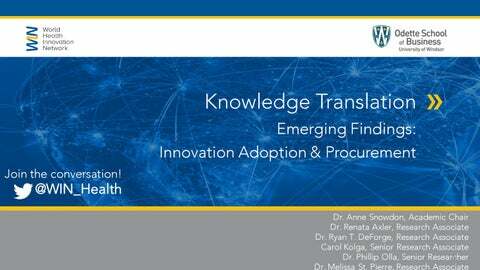 Knowledge Translation Emerging Findings: Innovation Adoption & Procurement Join the conversation! Overview WHAT is innovation procurement? WHEN & WHY might it be used? HOW can it be done well? What are the enablers & challenges of innovation procurement? Vendors are invited (in-person) to meet with the procuring organization to discuss the state of the market, the art of the possible, and partnership opportunities. Trade shows, reverse trade-shows, hackathons, etc. 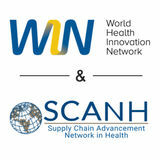 When	Should	Innovation	Procurement	be	Used? Who owns the IP in a co-created solution? • Engaging Key Opinion Leaders and “luminaries in the field” in co-design and as early adopters. Surfacing Value in Innovation Adoption and in Innovation Procurement What do we mean by “value”? A quality based on a person’s principles or standards, one’s judgment about what is valuable and important in life, and what a person deems important. Value Propositions for Patient, Clinician team, Organization, System Patients value access, improved health outcomes, positive experience Clinical teams value workload efficiencies, improved effectiveness Healthcare organizations value patient flow, cost Healthcare systems value quality (error, performance), cost The inability to surface value – to understand how it varies in a particular context, to present an innovative solution in terms of value propositions, to measure impact – can impede partnership development and broader, widespread adoption.